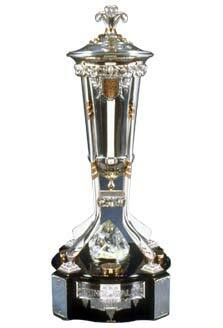 His Royal Highness, the Prince of Wales, donated this trophy to the National Hockey League in 1924. 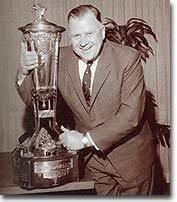 From 1927-28 through 1937-38, the award was presented to the team finishing first in the American Division of the NHL. From 1938-39, when the NHL reverted to one section, until 1966-67, it was presented to the team winning the NHL regular season championship. With expansion in 1967-68, it again became the divisional trophy, awarded to the regular-season champions of the East Division through the end of the 1973-74 season. Beginning in 1974-75, it was awarded to the regular-season winner of the conference bearing the name of the trophy. From 1981-82 to 1992-93 the trophy was presented to the playoff champion in the Wales Conference. Since 1993-94, the trophy has been presented to the playoff champion in the Eastern Conference. Beginning with the 1993-94 season, the club which advances to the Stanley Cup Finals as the winner of the Eastern Conference Championship is presented with the Prince of Wales Trophy. Leading winners: Montreal Canadiens (25), Boston Bruins (16), Detroit Red Wings (13). The last organization to win the Prince of Wales Trophy three consecutive years was the New York Islanders (1982-84).